Personalized mini address number sign is an upscale solution for small commercial signage applications and residential usage. Perfect for room numbers. 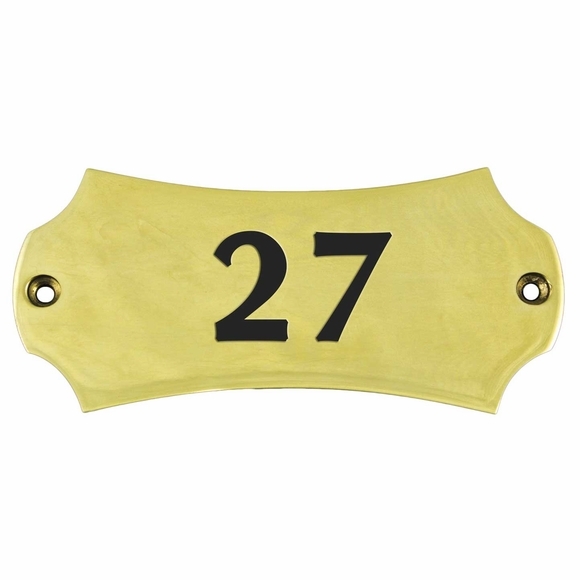 Small polished brass wall signs are uniquely suited to interior and unit numbering in offices and office parks; hospitality venues; schools; condo, apartment, residential communities, etc. ; and on smaller porches and multi-unit townhouses. Available in two miniature sizes: 3.5"W x 1.75"H (sample unit number 27) and 5.25"W x 1.875"H (sample unit number 805). Both enhanced rectangle address plates hold up to three characters (including spaces and punctuation). Deeply engraved and enamel filled. Personalized with the unit number you supply and the engraving style (font) you select. Four engraving styles: clarendon, old english, optima (shown in both images), and script. Small image on right contains a sample of each engraving style. Color: polished brass with black unit number. Special order. Please allow 3 to 4 weeks for delivery. Comfort House P2706.